Light sources specially adapted for heating, e.g. infrared sources as used in light ovens. Not only the electric elements and circuitry designs are covered by this subclass but also the electric aspects of their arrangement, where these concern cases of general application. Where heating elements are used in specific applications, please see the relevant subclasses. Circuit arrangements for electric light sources. The primary circuits of the above light sources and the elements themselves of the circuits are covered by this subclass. The above light sources when combined with light sources of a different kind are also covered by this subclass. Uses of electric heat sources, or apparatus incorporating such heat sources, are too numerous to mention and cover all possible areas of technology. Examples of places where such uses or apparatus could be found include A47J (domestic cooking); B21J, B21K (forging by heat); C21, C22, C23 (metallurgy); F24 (domestic heating and stoves); F27 (furnaces and ovens). See also the references below. Uses of electric light sources are also too numerous to mention and cover all possible areas of technology. Class F21 covers the material arrangement of the various electric elements, i.e. their geometrical or physical position in relation to one another, such as the structures or constructional features of lighting devices incorporating a light source, electric or otherwise. Numerous areas of technology, e.g. F21. General automatic switching arrangements specially adapted to heating applications, when no specific class exist for the particular heating application. Control of heating devices, when no specific class exist for the particular heating application. H05B 1/0202 relates to automatic switching. H05B 1/0227 relates to automatic control, classified according to the type of application. Heating by applying a voltage to a material with a certain conductivity, so that an electric current is generated that will according to the resistivity of the material will dissipate energy in form of heat. According with this type of generation of heat, the heat can be generated in the same object that needs to be heated, or otherwise the heat has to be transferred to the object that needs to be heated by radiation, conduction or convection. H05B 3/06 does not cover connectors (suitable) for heating elements, but covers the particular cases when the heater is structurally combined with the technical means allowing the electrical connection, otherwise only the classification in connectors, i.e. in H01R, applies. H05B 3/10 deal with heater elements characterised by the composition or nature of the materials or by the arrangement of the conductor. H05B 3/34 covers car seat heaters. H05B 3/50 covers any car air heater (independently of the structure of the heater). H05B 3/62- H05B 3/66 deal with heating elements specially adapted for furnaces. H05B 3/62-H05B 3/82 only cover electrical details, or details about the generation or transmission of heat. For other mechanical details the corresponding F24 or F27 class applies. Control of cooking plates is covered by H05B 6/062. Control of cooking appliances other than cooking plates is covered by H05B 6/06. Apportioning of the total heating power among the different heating coils is covered by H05B 6/065. Also apportioning in time, e.g. cyclic powering on and off of each heating coil. Also supplying a coil from multiple generators or multiple coils with a controlled amount of power from multiple generators. Also synchronisation, e.g. for avoiding generation of noise, or avoiding electromagnetic interferences. Not simply matrix heating plate per-se. Induction heating apparatus, other than furnaces, for specific applications are covered by H05B 6/10. Cooking devices are covered by H05B 6/12 but control of induction cooking devices is covered by H05B 6/06 and continuous movement of food is covered by H05B 6/10. Induction cooking plates or the like and devices to be used in combination with them are covered by H05B 6/1209, but control for induction cooking plates is covered by H05B 6/062 and ohmic heating plates are covered by H05B 3/68. H05B 6/1218 deals with induction cooking plates with arrangements using lights for the indication of the state of the heating zones. The typical application deals with the provision of LED's on a cooking area that are switched on when the induction heating power of that cooking area is switched on. Also particular details of the glass ceramic plate in order to achieve such effect, for example cut out, and darken areas to only illuminate the desired portion of the cooking area. Also glass plates having a substance or material sandwiched there inside that will interact with the magnetic field of the induction coils so that light is generated when the corresponding induction coil is switched on. H05B 6/1227 deals with Induction cooking plates specially designed for wok pans, or similar shaped pans; also wok supports specially adapted for induction cooking (facilitating magnetic field transmission, coils provided inside the support...), cook-tops with wok-shaped upper surface (so substantially concave upper surface), but also cylinder surface with coils from top to bottom; wok is also called Chinese Pan. H05B 6/1236 deals with Induction cooking plates adapted to induce current in a coil to supply power to a device and electrical heating devices powered in this way, If it is described any of the heating device itself or a particular control of the cook-top to recognise the load and correctly supply it with power. Typically the system acts as a transformer. The heating device is provided with a secondary coil for which the induction coil of the cook-top acts as primary. H05B 6/1245 deals with induction cooking plates with special coil arrangements. The typical application deals with a particular coil material, coil shape, coil geometry , coil position within the plate or with respect to other coils. H05B 6/1272 deals with induction cooking plates with more than one coil or coil segment per heating zone. Also when different concentric coils or coil segments or section with different coil distance or winding direction are provided . Also when coils are provided in different planes for the same heating zone. H05B 6/1281 deals with induction cooking plates with flat coils. This means that the coil as a whole is constructed in a flat distribution, the coil conductor can however present a non-flat section. The typical application deals with coils particularly designed to be have a small total thickness, normally by printing a conductor on a substrate or by having a thin conductor embedded in a substrate. The flatness of the conductor used for the coil is not relevant. H05B 6/129 deals with induction ovens. These are domestic appliances similar to a kitchen ovens wherein the heating means include at least an induction coil, (possibly in addition to any of the traditional heating means resistance heating, microwave heating, convection heating). Also induction heated trolleys, for catering, for example in airplanes. Also pop-corn machines (provided there is a closable / closed) cavity. Also vending machines in general (provided there is a closable / closed) cavity. Also induction warming drawers or the like (provided there is a closable / closed) cavity. Metal heat-treating apparatus only if there is a closable / closed cavity (therefore if it looks like a domestic oven). This class applies to cooking, de-freezing, warming, heat treating and re-heating appliances (the temperature achieved is unimportant). H05B 6/14 can be assigned in combination with any of H05B 6/36, H05B 6/101 and H05B 6/105. H05B 6/1209 takes precedence over H05B 6/34. H05B 6/36 deals with coil arrangements with flat coil conductors. This means that the conductor used for the coil present a flat section (as a band), but the coil itself can have a (not flat) tri-dimensional distribution. H05B 6/6402 deals with aspects relating to the microwave cavity but multiple cavity ovens are covered by H05B 6/80, continuous movement of material is covered by H05B 6/78, ovens specially adapted to a particular application are covered by H05B 6/80. H05B 6/6408 deals with support or covers for the load inside the cavity. Supports or covers including microwave susceptors (e.g. browning plates) are additionally covered by H05B 6/6494. H05B 6/6414 deals with aspects relating to the door of the microwave heating apparatus but microwave leakage is covered by H05B 6/76, and microwave leakage testing is covered by H05B 6/6432. 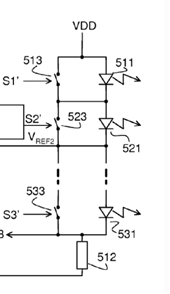 H05B 6/6417 deals with door interlocks of the microwave heating apparatus and related circuits. 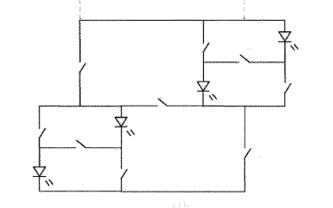 Also door position detecting circuits (e.g. with switches). H05B 6/642 deals with the cooling of the microwave components and related air circulation systems, however if the refrigerating air is being re-circulated through the cavity for convection heating the class H05B 6/6476 is relevant instead. H05B 6/6426 deals with any aspect relating to the exterior of the microwave heating apparatus, e.g. metal casing, power cord. Also handles (in portable microwave ovens) to allow carrying the microwave oven. Portable microwave ovens are additionally covered by H05B 6/80. H05B 6/6432 deals with aspects relating to testing or detecting leakage in a microwave heating apparatus. This means detecting or testing the microwave radiation leaking out of the microwave oven but also microwave switching off upon detection of microwave leakage. Also testing the quality of microwave seals and screens by measuring the microwave leakage. However, detecting leaked or reflected microwaves going back to the magnetron is covered by H05B 6/76. H05B 6/6447 deals with methods of operation or details of the microwave heating apparatus related to the use of detectors or sensors. However detecting reflected radiation for feedback control purposes is covered by H05B 6/705. H05B 6/645 deals with the use of temperature sensor or thermistors for detecting the temperature of interior of the cavity or the product placed inside. However detecting the temperature of the magnetron or any related safety aspect is covered by H05B 6/666. Details of particular circuits or particular components of the microwave generation circuit, e.g. a particular capacitor, a particular inductor... are classified under H05B 6/66 when no other more specific subgroup is provided for. H05B 6/662 deals with aspects related to the boost transformer of the microwave heating apparatus. However cooling of the boost transformer is covered by H05B 6/642. H05B 6/68 deals with circuits for monitoring or control. Typically the power supplied is controlled in a feedback loop. Includes monitoring input / output voltage / current / power in a feedback loop. Also if it is described compensation of the cooking time taking account of fluctuations in the power supply, temperature in the cavity or variables of the magnetron. If the presence of an inverter or of a solid state oscillator is not specified then this group is given and not the sub-groups. Also avoiding generation of harmonics. Also ZVS and ZCS. H05B 6/681 deals with circuits comprising an inverter, a boost transformer and a magnetron. Determinant is the presence of an inverter (there will always be a boost transformer and a magnetron). Includes methods of switching the inverter to regulate power (Duty-Ratio control and Frequency control). However, H05B 6/681 does not cover control based on sensors readings of non electrical variables (e.g. temperature, humidity... inside the cavity), covered by H05B 6/687 and H05B 6/6447. H05B 6/686 deals with circuits comprising a signal generator and power amplifier, e.g. using solid state oscillators. Determinant is the presence of any of a power amplifier or a solid state oscillator (one implies the other). compensation of the cooking time taking account of fluctuations in the power supply, temperature in the cavity, temperature of the magnetron or age of the magnetron covered by H05B 6/68. H05B 6/688 is equivalent to H05B 6/687 but for the case of thawing. H05B 6/70 deals with feed lines. This means the special way of providing microwave radiation to the load (not provided for in the sub-classes), like: application of microwaves using antennas inserted in the load; application of microwaves from multiple directions and/or with different parameters (frequency, phase, power); modification of the cavity (both periodically or according to a feedback control). H05B 6/701 deals with the use of microwave applicators. It is not enough the mere mention of the word applicator (as any cavity can be called applicator, and this interpretation would be too broad). Typically for continuous movement of material (but not only). The waveguide ends with a particular shape that acts as a resonant cavity. To distinguish from the subject-matter covered by H05B 6/6402, it is considered an applicator when the applicator is a resonant cavity of dimensions similar to those of the waveguide and in this sense the applicator/cavity can be considered a continuation of the waveguide or waveguides. However, magnetrons providing microwaves directly to the cavity or only using a coaxial cable (so no waveguide) are covered by H05B 6/70 or H05B 6/702. H05B 6/702 takes precedence over H05B 6/707 and s.gr. when coaxial cables are used in combination with waveguides. H05B 6/704 deals with the use of microwave polarisers. This includes when there is an explicit description of means for polarising the microwave radiation and also when it is described a method or apparatus where the use of polarised microwave radiation solves a technical problem. H05B 6/705 deals with the use of microwave tuning. This includes changing the phase of the microwave radiation at the point of entering the cavity. Typically a waveguide with movable parts is used to change the phase of the standing wave generated. Microwave tuning comprises also impedance matching. Also changing the frequency with the intention of obtaining minimal impedance at the input of the cavity (in a feedback loop). Also detecting / sensing / measuring the microwave radiation reflected / not adsorbed, typically to make a feedback control on the power, frequency, phase applied (also with multiple microwave sources). H05B 6/707 deals with the use of waveguides. Also when multiple waveguides are used. However, waveguides used in combination with coaxial cables are covered by H05B 6/702. H05B 6/72 deals with radiators or aerials. Also when multiple antennas are used. Antennas can receive microwaves directly from the magnetron, from a waveguide or from a coaxial cable. H05B 6/725 deals with rotatable antennas. This also includes microwave stirring devices located inside the waveguide or at the opening of a waveguide to the cavity. H05B 6/74 deals with mode transformers or mode stirrers. Stirrers are not antennas. The stirrers "only" reflect microwaves coming from the walls of the cavity. Also Cavity with moving walls or changing shape. However, microwave stirring devices placed inside a waveguide or at the opening of a waveguide to the cavity are covered by H05B 6/72. H05B 6/76 deals with the prevention of microwave leakage, e.g. door sealings. This includes also screens or deflectors for avoiding radiation back into the waveguide or in the magnetron. Also using dummy loads. However, detection of microwave leakage is covered by H05B 6/6432. H05B 6/763 deals with microwave radiation seals for doors. However, mere air seals are covered by H05B 6/6414. H05B 6/80 deals with microwave apparatus for specific applications. Also particular apparatus for cooking / Thawing a particular food product. Also special type of microwave ovens, (e.g. portable, for vehicles or with DC power supply). Also multiple cavity oven. Also microwave oven with a separate cavity functioning as toaster, eventually in combination with other relevant classes (H05B 6/6414, H05B 6/6402). H05B 6/802 deals with microwave apparatus for heating fluids. H05B 6/806 deals with microwave apparatus for laboratory use. Typically it is mentioned a chemical reactor or similar. H05B 6/806 takes precedence over H05B 6/802. Details about the electrodes of electric discharge heating apparatus, including mounting of the electrodes, electrical and mechanical connections. Also methods of supplying current and controlling power in electric discharge apparatus. Also heating by glow discharge and heating by arc discharge. Indirect Radiation from the arc is focused (e.g. by an ellipsoidal mirror) into a projection on a work being heated. Heating by combined application of ohmic heating, induction heating, dielectric heating or electric discharge heating. Lamps where an arc is established through air or a gas mixture using consumable electrodes (for example carbon rods). Elements, compositions, chemical compounds capable of emitting light and circuit arrangements for driving said sources. The sub-range H05B 33/08 dealing with electronics has to be circulated to and classified separately in H05B 33/08. OLED's have to be circulated to H01L 51/00. Other aspects of semiconductor have to be circulated to the appropriate classes, mainly in H01L. Control of white light is classified in the colour section H05B 33/0857 and subgroups. Documents describing LED loads formed by parallel strings of LEDs, wherein each of said strings may be individually controlled by provided circuitry. RGBs, current mirroring, active current balancers, minimum voltage selectors, in general when the parallel branches are gated for some purpose. This symbol should be given as CCI when the invention relates to the load configuration. This symbol should be given as CCA a load matching the definition can be observed in the document, but it is not the subject-matter of the invention or no details of it are provided. 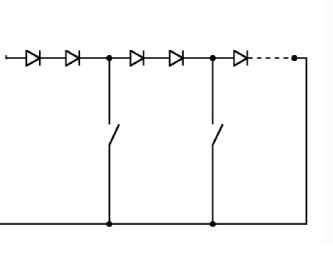 Typical problems appearing in the documents with this symbol are: accommodation of potential in a chain of series-connected LEDs, adaptation of the number of LEDs to various supplied voltages. Catch-all for LED control aspects not covered by lower subclasses. Examples of subject matter covered in this subclass: time switching, focus/target/beam control, LED flashes, LEDs as sensors, power saving aspects, shift registers control (simple sequences), emergency lights (when no other aspect is more relevant). Documents relating to control of LEDs but wherein no details about specific aspects of LED control are given may be given this code; in particular in combination of symbols in H05B 37/00. This subclass is a catch-all for LED control details, it is strongly recommended using it only as last resource. Use the subclasses underneath for classifying the relevant control aspects. H05B 33/0845 (control of intensity) and H05B 33/0857 (colour control) trees are mutually exclusive. This group is meant for two types of light sources used simultaneously. Phosphors or different coloured LEDs are not to be considered as dissimilar light sources for the purpose of this group. Gas-discharge or vapour-discharge lamps with light-emitting discharge path and separately-heated incandescent body within a common envelope. In case of failure of the lamp, circuits providing for substitution: H05B 41/46. Application circuits for control of light sources. Where the focus of the control is in the application and not in the light source, controlling the light source when some external condition occurs (light dependent, occupancy, data communication, etc). Building Automation Systems as e.g. domotics. Circuits controlling the light intensity of incandescent lamps. Circuits and drivers for discharge lamps.